The nation’s intercity passenger rail service just got a lot bike-friendlier. Amtrak announced last week that it is installing new baggage cars — equipped for bike storage — in all trains on its long-distance routes by year’s end. The change will allow Amtrak riders to “roll on” their bikes, rather than disassembling them and transporting them in boxes. The new baggage car equipment is being tested in Chicago, New Orleans, Miami, and the Northeast Corridor, Amtrak officials said in a blog post. Amtrak officials hinted the more convenient bike transport was in response to demand from consumers. 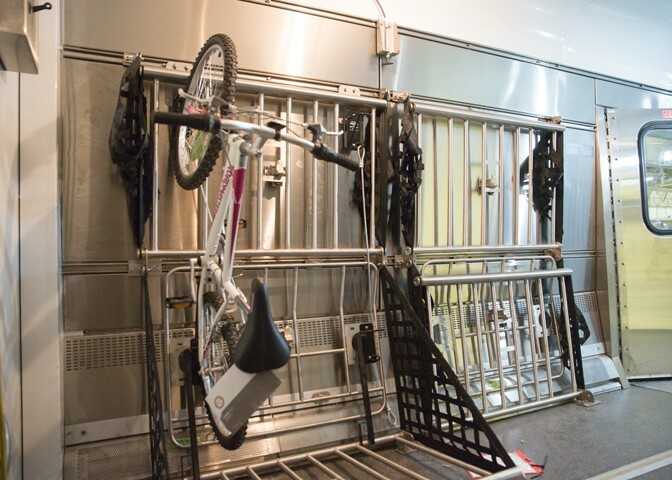 Campaigns aimed at securing assembled bike storage aboard Amtrak routes have been waged in New York and other states. Only a handful of Amtrak routes currently allow a limited number of fully assembled bikes. “It’s clear that Americans want a national system of intercity passenger rail and Amtrak is moving ahead to build new equipment to meet customer demand,” said Amtrak President and CEO Joe Boardman in the blog post. In the comments, people were already indicating their intent to ride Amtrak more. All we need to do now is lean a bit further west. Looks like the east coast is getting the better end of this picture. That’s good, but lets go further west. Amtrak, you still have my business even though I’m boxing your box. Big thumbs up to Amtrak. Looking forward to using the future system to go west. Fantastic! More trains and bikes will make this country better. A less-than-half measure. You should be able to wheel your bike on and off the train yourself wherever you want to get on or off. Western European railways have offered this for at least 40 years. Your situation has nothing to do with baggage cars, new or old. Amtrak treats folding bikes as carry on luggage. You just happened to run into a nice conductor, or possibly a coach attendant, who helped you, rather than watch you struggle up the steps. First of all, if Kevin has received a sneak preview of what the procedures will actually, I’d like to hear about it. But one reason why you can’t just roll the bike on is that outside the NE Corridor almost all station have low level platforms. My hat is off to your 92 year old grandmother if she rides a bike. Where I live, if you want to blow your nose you are expected to get into a car, whatever your age. If I’m around when she wants to board, I’ll be glad to help her. Unless you bicycled back your starting point and your car, I presume you used one of Amtrak’s Missouri Service trains. They do have roll-on, roll-off bike service. Does anyone know how to get notified ahead of time when the new bags will debut on the Capital Limited? I want to be on board the first departure on my way to the Great Allegheny Passage. Dutch people over the age of 65 make 24% of all their trips on bicycles. Having to rely upon random strangers is not a sustainable model. The timeframe is correct. The service will start around the same time the new baggage cars start running on the trains, which is going to be around the end of the year. …it probably will be deployed on one route at a time. Don’t expect ALL routes to have it by the end of the year. Do expect the first route to have it. And they have bicycle sections on the European trains as well. Traveling through Germany a few years ago, I was not only able to wheel my bike onto the train and keep it next to my seat, but visit with the other cyclists there as well. And you (and your bike) can get on or off anywhere the train stops. Great way to travel and meet people. Why hasn’t Amtrak figured this out? Probably because it’s too simple. I agree it is a less-than-half measure. I want to get off at some small stations that don’t have baggage service but, apparently, the fine print says the roll-on/off policy only applies to stations with baggage service. Stupid. Amtrak recently announced that the mix was changed to 70 baggage and 10 baggage-dorms. No indication why. It’s nearing the end of 2014 when Amtrak announced the new baggage cars equipped for bike storage. Any updates? Want to do this June 2015 and we are hoping it will be up and running by then. This author doesn’t know what she’s talking about haha jk! Great news! I am responding to a story from last summer in order to ask whether anyone has heard of updates to this. The “Walk-On Bicycle Service” section of this page http://www.amtrak.com/bring-your-bicycle-onboard at the Amtrak site doesn’t seem to have changed since I last checked it. I had hoped that, by summer of 2015, it would have been possible to take my bike on Northeast Corridor trains. But I should give up on that hope, shouldn’t I? What Will Become of Amtrak If It’s Left Out of Plans to Expand HSR?